On Monday September 22 we are launching together with Unibail-Rodamco, "El Armario Solidario" campaign , which aims to promote textile recycling and bring citizens the importance of giving a second life to the clothes you no longer use. The singer and musician Antonio Orozco is responsible for sponsoring this initiative. The campaign started in Leganés Parquesur Mall. 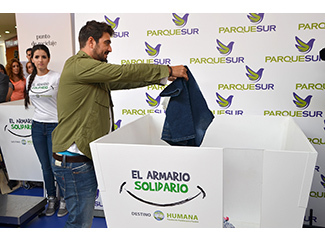 From 22 to 24 September there will be a stand in 'Plaza Barcas' for collecting clothes, which simulates a closet and has a scale that will calculate the pounds of textiles and footwear donated during the two days of collection. Textiles collected is subject to the usual process we conducted with used clothing.